Mix and Chic: Moodboard- Moodboard Challenge At Finishing Touch Interiors! Moodboard- Moodboard Challenge At Finishing Touch Interiors! It's Monday again and it's time for another 'Moodboard Monday Challenge' at Sarah's blog, Finishing Touch Interiors. This week's challenge is 'Retro Hotel Room'. When I think of a retro room, I think about retro colors like olive green, orange and mustard yellow. I have to admit this is one of the most challenging moodboards I have ever done so far. It is not easy to find a beautiful retro bed and accessories that I like. 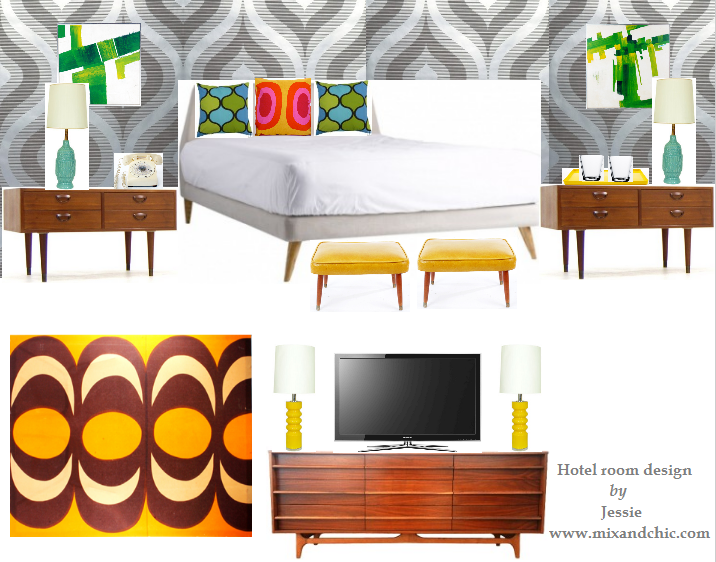 The look I was going for is a stylish retro hotel room with pops of bright, happy colors furnished with both retro and mid century modern pieces. This is what I came up with. What are your thoughts? Do you think I have successfully created a retro hotel room or otherwise? Do you like the assortment of colors I used? Sarah has invited other designers to join her in the moodboard challenge as well so if you want to see what other designers came up with, please click here. By the way, Sarah will also be hosting an open challenge on Monday, February 6 with the Pink Challenge to help raise awareness for breast cancer. This challenge is open to everyone. Just send an email with your PDF moodboard and your details to Sarah at sarah@finishingtouchinteriors.co.uk by Friday, February 3. There will be a prize for a winner as well. Please click here for further details regarding the Pink Challenge. Don't forget to join me again next week for another Moodboard Monday Challenge. Have a great week! It's so fun and chic! I love the bedside tables and the wallpaper you chose! I'm also crazy about the desk chair! 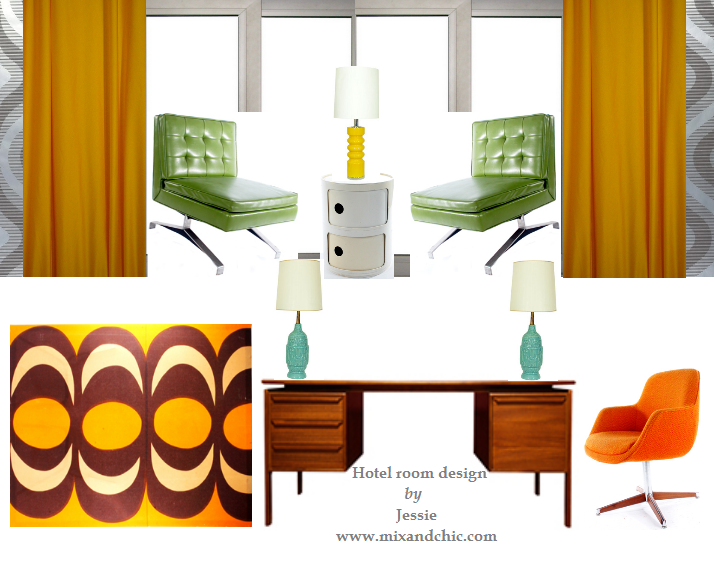 Great work Jess <3 Love the green & orange chairs & the lamps! You for sure accomplished the look successfully! I love all the mid century pieces with the bright pops of color. I would book a room! this is super cool! Very retro!! I would stay there for sure! :) Hope you had a great weekend Jessie! Just loving the pops of color! Jessie, I always love your mood boards. Your ideas are always fresh and right on!